For the first time a Naga and Indian human rights activist have jointly written a book on how military rule has been imposed on the peoples of the North East by a democratic Indian State. The focus of the book is the unspeakable horrors committed by the Indian security forces during a counter-insurgency operation code-named Operation Bluebird and how ordinary Naga villagers with the help of a small group of lawyers and activists fought for justice against the Indian security forces in an epic court battle. The authors weave into their story the long history of how people have challenged the Armed Forces (Special Powers) Act and the shocking way the courts have systematically denied the people of North East legal justice for so many decades. The book does not only tell stories of human rights violations but also gives an in-depth analysis of how civil administration is disabled when an area is declared disturbed under the Act. The documentation includes the confidential letters, secret wireless messages and curfew orders passed during the Operation. The reader is provided a deeper insight into the working of this pernicious Act which has been extended to Kashmir. The book cannot be ignored by anyone concerned with the future of democracy in India. 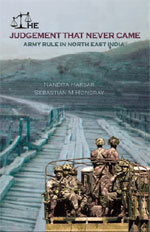 The authors are human rights activists and at present involved in the Indo-Naga peace process.